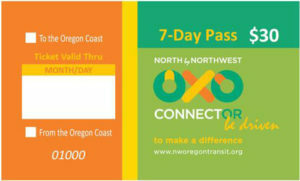 3-day and 7-day visitor passes may be purchased from drivers on any route served by NW CONNECTOR partner agencies. Visitor passes allow one trip to the coast from Portland or the Albany/Corvallis area, one return trip, and unlimited travel in Clatsop, Tillamook and Lincoln Counties (from Astoria to Yachats). 3-day passes are $25.00. 7-day passes are $30.00. You can purchase your pass from your driver. Drivers accept only cash and exact change is required. Your pass is your receipt.